Let’s face it: When it comes to both talent and who’s in charge, the design industry is still predominantly male. Historically, only a few female names rose to icon status—and we all know it was no easy journey for the likes of Ray Eames, Charlotte Perriand, and Eileen Gray. Meanwhile, change sputters on at a turtle’s pace. Women, however, continue to fight this underrepresentation, often working harder while facing everyday gender discrimination on an uneven playing field, according to Woman in the Workplace 2018, a sobering study conducted by McKinsey & Company in partnership with LeanIn.Org. At the 2019 Milan Furniture Fair, these seven female designers, with standout new product launches, proved they don’t need cojones to close the gap. Solidarity has power—and three graced the rooms of Rossana Orlandi, the celebrated gallery by the Milanese design enthusiast of the same name. It’s in the arenas of fiber and textile media where Liz Collins shines. 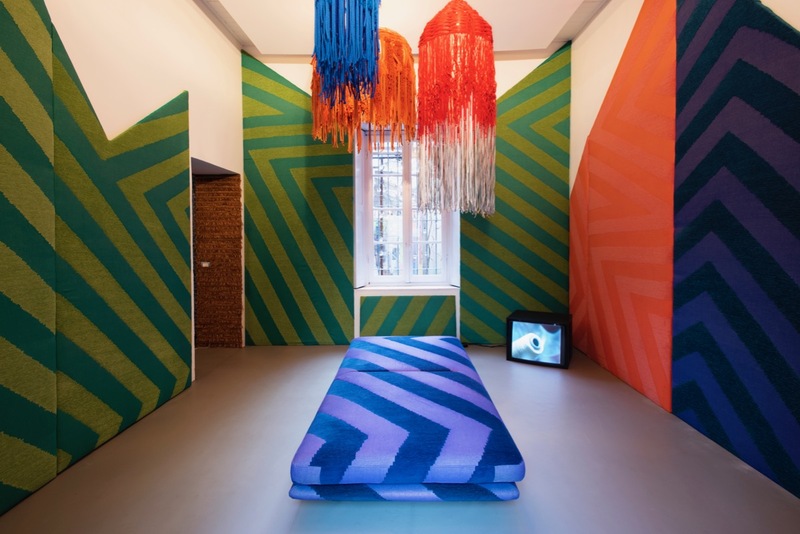 In collaboration with performance-based fabric manufacturer Sunbrella and French furniture brand Ligne Roset, the Brooklyn-based designer took over three rooms of Spazio Rossana Orlandi for “Summit Suite,” a two-story installation of emboldened, vibrant color. For the “Mountain Room” pictured above, Collins designed a custom-woven Sunbrella pattern for upholstered wall panels and Christian Werner’s Prado sofa. Dropping from above, a trio of chandeliers are woven Sunbrella cords. “I had to believe in myself and our company, despite the challenges presented by being a woman and an artist,” says Spanish designer Nani Marquina, founder of venerable Spanish textile brand Nanimarquina. “The double label certainly took time to disprove—women are not weak and artists can be strong-minded people who can make business decisions.” Fighting diversity is always better in pairs, and natural and local fibers provide a raw, lived-in beauty in Nanimarquina’s new Wellbeing collection. Presented at Salone del Mobile, the line includes rugs, a hammock for indoor spaces, cushions, a throw, and a wall tapestry created in collaboration British designer Ilse Crawford, founder of Studio Ilse. “Where there is fragility, there is strength,” says London-born and New York–based furniture and interior designer Anna Karlin. 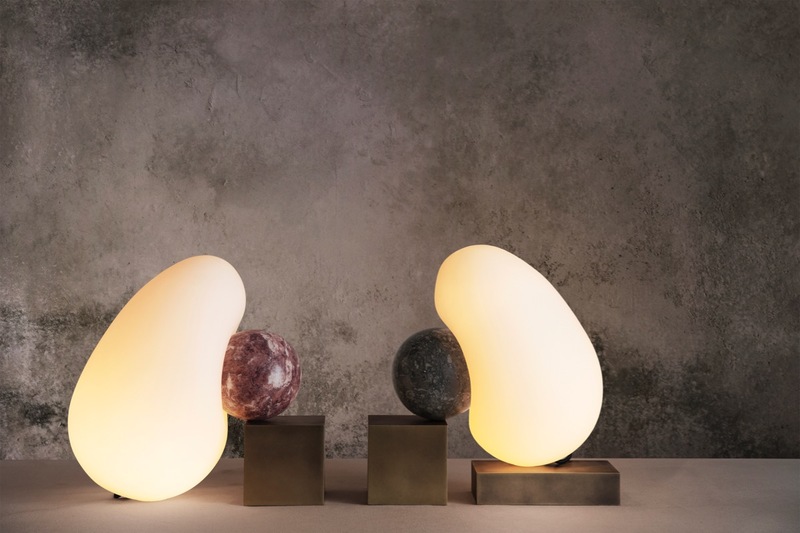 Her Milan premiere took place at Spazio Rossana Orlandi, where she showcased examples from the Subverting Domestic Familiarity collection, among them the Dimple Lamp. An exploration of dependency and support, Dimple is made of glass, metal, and marble, with its distinctive sculptural form relying on the relationship between the three. For a collection of Kasthall rugs, wall hangings, and accessories, British designer Lara Bohinc, founder of London-based Bohinc Studio, turned to the soothing beauty of Japanese zen gardens. 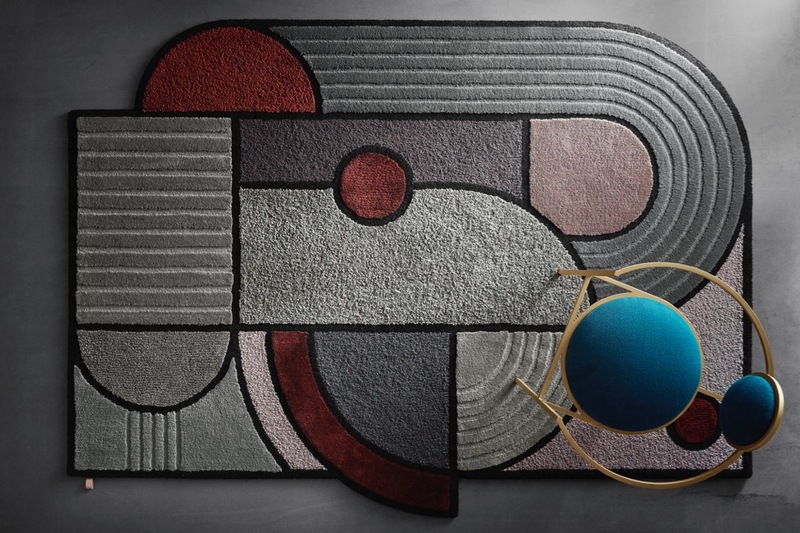 In mesmerizing geometry, her two hand-tufted wool carpets are a study of the motifs of rocks, gravel, and rippled sand. Likewise, nature is also the muse for a color palette distinguished by muted pastels, earth, and rust. With a degree in fine arts, Dutch designer Geke Lensink once worked in exhibition design—that is, before an about-face in 2008. On view at “Design Language,” an exhibition exploring cultural identity, the Souvenir family of furnishings draws inspiration from Lensink’s extensive travels and cultural reflections. 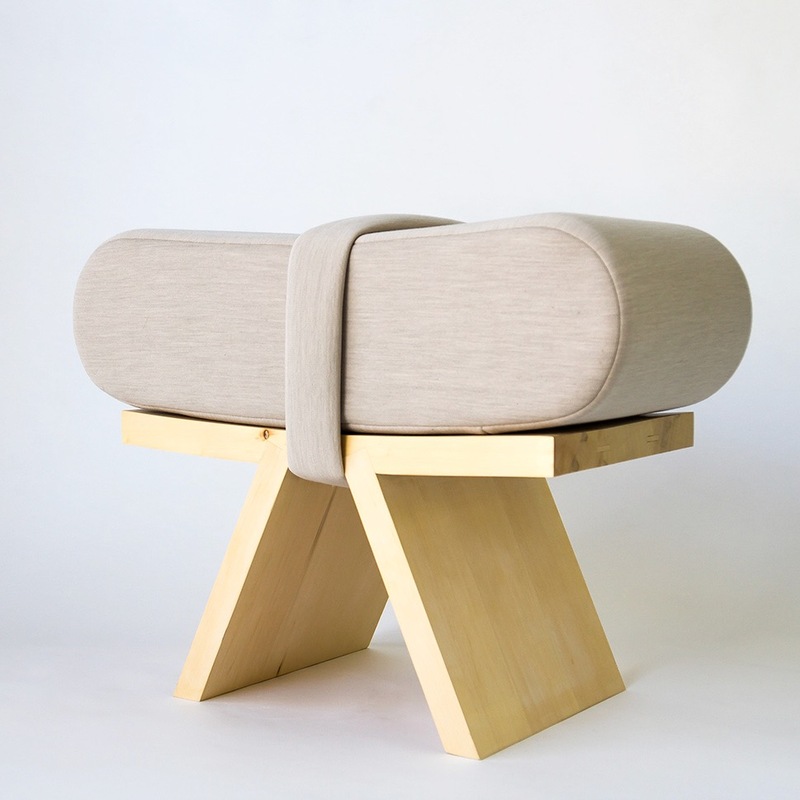 In addition to a stool that recalls—with its strapped-in cushion—a giant sushi, the collection includes a bench, lounge, side table, jar, and plate. The Light Capiz side table, shown with the shells used to make it. 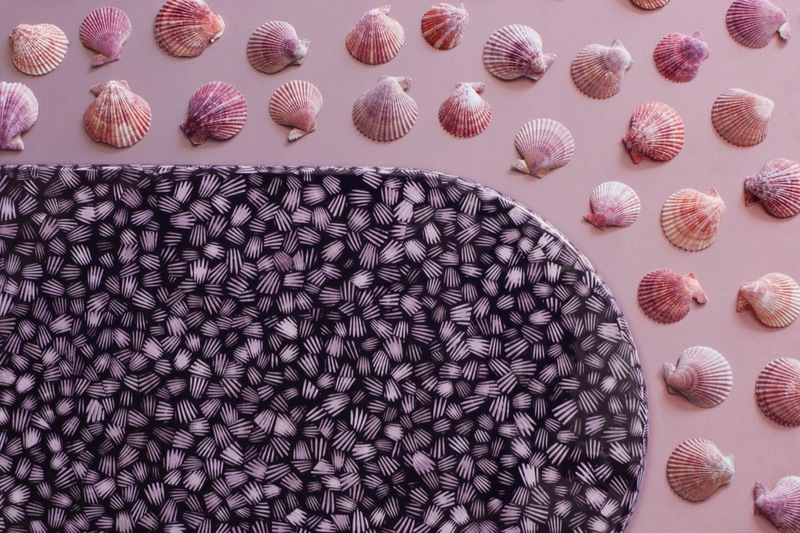 Shells and feathers considered trash find new resin-trapped life in Exploring Eden, a collection of furniture and accessories by British designer Bethan Gray. Trimmed scallop shells are meticulously arranged to create the Light Capiz side table, which along with jade and pheasant feather lounge chairs, pearl shell cylindrical stools, and a pen shell coffee table were presented at Spazio Rossana Orlandi.